Roof systems are usually incorporated in all types of passenger vehicles, such as hatchback, sedan, and utility vehicles. Roof systems, along with enhancing driving experience, provide additional fresh air supply, more light, and a feeling of more space in the passenger compartment. The different types of roof systems are panorama roof system, sunroof system, multi optional roof system, and solar roof system. Lightweight material and design play a key role in product design in the automotive industry, where esthetics and driving dynamics are important factors. Utilization of lightweight materials is expected to rise significantly in the automotive industry in the near future. All lightweight materials offer weight reduction potential at a higher cost. Substitution of steel roof panels by lightweight aluminum alloy is an attractive option in order to reduce the overall weight of vehicle and to optimize the mass distribution in the vehicle. Use of aluminum for roof system in the vehicle helps lower the vehicle’s centre of gravity and approximately saves about 7 kg, as compared to the weight measured by employing steel. Rise in demand for fuel-efficient vehicle and stringent emission norms in the near future are likely to propel the demand for light weight roof system during the forecast period. Consumers demand more light, air, and space in modern vehicles. The trend is toward an efficient vehicle along with focus on entertainment and functionality. Therefore, automakers and roof system manufacturers are developing innovative roof systems that explore new avenues in vehicle design, which in turn is anticipated to boost the automotive roof system market during the forecast period. The global automotive roof system market has been segmented based on type, material, passenger vehicle, sales channel, and region. In terms of type, the global automotive roof system market has been classified into panorama roof system, sunroof system, multi optional roof system, solar roof system, and convertible roof system. Panoramic sunroofs enrich the vehicle exterior and keep the vehicle interior fresh. They enhance the esthetic appearance of the vehicle. Hence, demand for panoramic sunroofs is rising in luxury and premium-class vehicles. Rise in demand for vehicles is primarily ascribed to the increase in world population, transition in peoples’ lifestyle in several regions across the globe, development and expansion of infrastructure, and rise in affluent population. Based on material, the automotive roof system market has been segregated into aluminum, steel, polycarbonates, and others. Major OEMs are emphasizing on enhancing fuel efficiency. Polycarbonate is a lightweight, impact-resistant material that can reduce the weight of the vehicle. It can also be easily fabricated into modern designs and smooth curves. Polycarbonate not only reduces the weight of the roof panel by up to 50%, but also helps reduce fuel consumption and CO2 emissions, while maintaining strength, safety, and style. Consequently, the polycarbonate roof segment held a prominent share of the automotive roof systems market in 2017. Aluminum boosts dent resistance, as it is a lightweight material. Usage of aluminum in passenger vehicles is rising, owing to the rise in demand for fuel-efficient vehicles. Utilization of aluminum vehicle parts reduces the weight of the vehicle, which in turn augments the acceleration and curbs the overall gross vehicle weight (GVW) thereby enhancing the fuel efficiency. Light weight of vehicle enhances the acceleration and braking of the vehicle. High-end vehicles, such as Jaguar, have switched to aluminum alloy in body-in-white and also for the roofs. Premium vehicle manufactures have begun adopting aluminum alloy roof panels due to their high crash worthiness and weight saving ability, which in turn is propelling the aluminum segment. Prominent regions considered for the analysis include North America, Europe, Asia Pacific, Middle East & Africa, and Latin America. Regional level breakdown has been conceded out on the basis of vehicle production, adoption rate, GDP, presence of roof manufacturers and society demand. North America and Europe are anticipated to witness steady demand for vehicles, however, in terms of revenue, Europe is likely to dominate the global roof system market, owing to the higher penetration of panorama and solar roof systems in the region. Increasing production of premium vehicles in India and consumer demand for innovative roof system and high production of passenger vehicles as well as presence of automotive roof system manufacturers in China are likely to propel the automotive roof system market in Asia Pacific during the forecast period. Key companies present in the global automotive roof system market are anticipated to gain benefit from new product development with other global players involved in the development of roof system. Major players operating in the global automotive roof system market include AAS Automotive s.r.o., AISIN SEIKI Co., Ltd., ALUPROF Aluminiumprofile GmbH., BOS Group, CIE Automotive, Covestro AG, GAHH, LLC, Inalfa Roof Systems Group B.V., Inteva Products, JAC Products., Magna International Inc., THE HAARTZ CORPORATION, Valmet Automotive, and Webasto. This report analyzes and forecasts the market for automotive roof system at the global and regional level. The market has been forecast based on value (US$ Mn) and volume (million units) from 2018 to 2026. The study includes drivers and restraints of the global automotive roof system market. It also covers the impact of these drivers and restraints on the demand for automotive roof system during the forecast period. The report also highlights opportunities in the automotive roof system market at the global and regional level. The report comprises a detailed price trend analysis, government regulatory scenarios, value chain analysis, which provides a comprehensive view of the global automotive roof system market. The Porter’s Five Forces model for the automotive roof system market has also been included to help understand the competitive landscape in the market. The study encompasses market attractiveness analysis, wherein end-users are benchmarked based on their market size, growth rate, and general attractiveness. The study provides a decisive view of the global automotive roof system market, by segmenting it in terms of material, type, passenger vehicle type, sales channel, and region. These segments have been analyzed based on present and future trends. Regional segmentation includes the current and forecast demand for automotive roof system in North America, Europe, Asia Pacific, Latin America, and Middle East & Africa. The report also covers demand for individual type segments in all the regions. The study includes company profiles of major players operating in the global market. Key players in the automotive roof system market include AAS Automotive s.r.o., AISIN SEIKI Co., Ltd., ALUPROF Aluminiumprofile GmbH., BOS Group, CIE Automotive, Covestro AG, GAHH, LLC, Inalfa Roof Systems Group B.V., Inteva Products, JAC Products., Magna International Inc., THE HAARTZ CORPORATION, Valmet Automotive, and Webasto. Market players have been profiled in terms of attributes such as competitive landscape, manufacturing footprint, company overview, financial overview, business strategies, and recent developments. The market for automotive roof system is primarily driven by the rise in demand for eco-friendly vehicles. The report provides the estimated market size of automotive roof system for 2017 and forecast for the next nine years. The global market size of automotive roof system has been provided in terms of revenue and volume. 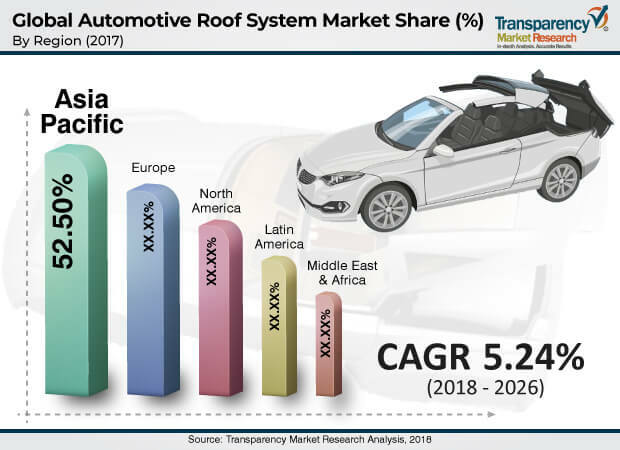 Market numbers have been estimated based on key type, material, passenger vehicle type, sales channel, and regional segments of the automotive roof system market. Market size and forecast for each major type and vehicle have been provided in terms of global and regional/country markets. Secondary research sources that are typically referred to include, but are not limited to, company websites, annual reports, financial reports, broker reports, investor presentations, and SEC filings, internal and external proprietary databases, and relevant patent and regulatory databases, national government documents, statistical databases, and market reports, news articles, press releases, and webcasts specific to companies operating in the market, National government documents, statistical databases, and market reports, American Automobile Association, European Automobile Manufacturers Association, Automotive Research Association of India, Organization International des Constructeurs d ‘Automobile (OICA), Factiva, etc.